The global market for hyaluronic acid products is moderately competitive in nature and is projected to remain in the similar situation throughout the forecast period, states a new market research report by Transparency Market Research. Some of the leading players operating in the global market are Anika Therapeutics, Inc., Merz Aesthetics, and Allergan, Inc. These players are expected to witness a significant level of competition, thanks to the growing focus on research and development activities and innovations in this field. In addition to this, the increasing number of mergers and acquisitions is estimated to help the key players in expansion of product portfolio is predicted to enhance the overall growth of the market in the next few years. 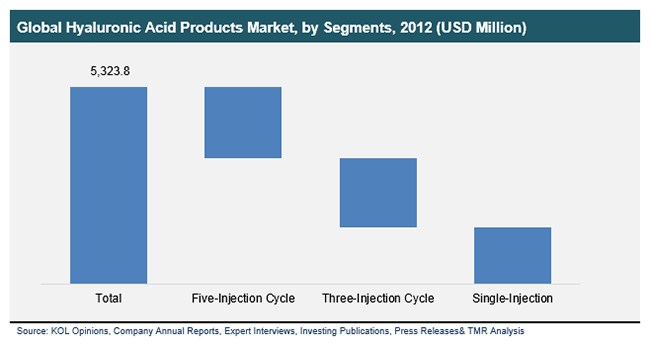 As per the study, a significant rise in the number of players is expected in the global hyaluronic acid products market. According to the market research report, the global market for hyaluronic acid products is expected to reach a value of US$9.85 bn by the end of 2019 and the market is likely to register a promising 9.20% CAGR between 2013 and 2019. From a regional perspective, the global market for hyaluronic acid products has been categorized into the Middle East and Africa, North America, Latin America, Asia Pacific, and Europe. Among these, North America is projected to witness high growth in the next few years. The increasing demand for hyaluronic in North America can be attributed to the presence of a several leading players and the growing demand across diverse applications. Europe is anticipated to remain in the second position in terms of market share throughout the forecast period. Furthermore, Asia Pacific is likely to experience a significant growth in the coming years. The rising number of developments in the healthcare sector is one of the key factors estimated to accelerate the growth of the Asia Pacific market in the coming few years. Among the key application segments, the dermal fillings segment is likely to account for a large share of the market and is projected to remain in its leading position throughout the forecast period. The vesicoureteral reflux (VUR) and osteoarthritis segments are further anticipated to register a promising growth rate in the coming years. The rising demand for minimally invasive surgical procedures is one of the major factors projected to encourage the growth of the market in the near future. Moreover, the rising geriatric population in a large number of developing economies is anticipated to accelerate the growth of these two segments in the coming few years. The global hyaluronic acid products market is expected to rise at a steady pace in the coming few years. The expansion of the product portfolio and the increasing number of applications are some of the key segments that are projected to accelerate the growth of the global hyaluronic acid products market in the next few years. Technological advancements and developments in this area are further estimated to enhance the market growth in the near future. On the other hand, the high cost of hyaluronic acid products is one of the major factors, which is predicted to restrict the growth of the global market in the next few years. Nevertheless, the rising number of mergers and acquisition, especially with local businesses is estimated to generate promising growth opportunities in the forecast period. Increasing number of application segments and the growing focus on development of new product is likely to enhance market growth. North America to register a healthy growth in the coming years that will be further followed by Europe and Asia Pacific.